On the October 6, 2013 episode, Sacramento entrepreneur Chris Johnson swam into the Shark Tank in hopes of scoring a deal with one of the panelists. 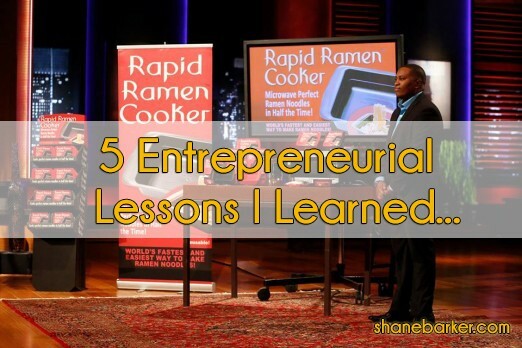 As a graduate of the University of California Davis, Johnson built an entrepreneurship to sell the Rapid Ramen Cooker. Unlike other products on the market, this unique cooker enables consumers to make ramen noodles in the microwave in a fraction of the time it takes to cook them on the stovetop. Impressed by Johnson’s pitch, billionaire Mark Cuban offered him a $300,000 package deal of a $150,000 loan and $150,000 purchase for 20 percent of the company. However, Christ Johnson countered the offer by negotiating the ownership to 15 percent for the same monetary amount and Cuban agreed. While watching the California native achieve his dream deal, the following are five lessons I learned that all entrepreneurs should know about negotiation. While Chris Johnson surely excelled at his sales pitch, Mr. Wonderful was immediately at the shark attack to inquire about the financial specifics. Luckily, the Sacramento entrepreneur had done his homework to be able to communicate the exact sales margins and profits to date. Whether you are presenting your company to a team of potential investors or simply expanding your business, it is crucial that you to understand all of the magic numbers that tell the real story about how much money is coming in and out of your account. Due to the rather simplistic design of the Rapid Ramen Cooker, the sharks showered Johnson with many questions about whether the cooker had been patented and if a competitor could potentially knock off product. If you are looking to stand out from the crowd to investors, it is wise to present a great product that has been patented or cannot be duplicated to safeguard against future risks. Investors will be much more attracted to a product with a patent because it suggests the probability of long-term success. All sharks in the business world are experts at spotting an entrepreneur that does not stand 100 percent behind his or her product. Therefore, it is essential that you demonstrate your passion for your company and confidence that it can succeed through every stage of negotiations. Johnson clearly impressed the panelists with how much effort he was putting in to make the company grow by picking up the phone and calling retailers across the map. Make sure to clearly showcase your love and willingness to fight for the company you are seeking to build. When preparing for your sales pitch, it is important to remember to focus on highlighting all of the strengths that investors could benefit from your company. Since any weak links in a pitch will be noticed by investment sharks like blood in the water, be sure that your pitch is free from any potential weaknesses that could come back to bite you. When you play up your strengths, you will have the confidence and advantage in the negotiation process. When Kevin O’Leary and Robert Herjavec provided Johnson with an arguably malicious offer packed with royalties and large equities, the Sacramento native never backed down and always stuck to his instincts about the goals for his company’s growth. Despite the fact that Mark Cuban had already dropped out of the running, the investor came back in with a deal of his own that mirrored the original asking amount and made an exceptional deal with Johnson. With this lesson in mind, make sure to not fall to easily in the trap of a less than pleasing deal that takes advantage of your company. Stick to your goals and guts, even if it means walking away empty-handed, because something better may come along shortly. Although reality television shows may be given a bad reputation, the hit series Shark Tank serves as the ultimate guide packed full of tips to sharpen your entrepreneurial skills. Use these five important lessons from this action-packed episode of Shark Tank to help you negotiate for the best deal for your entrepreneurship, just like Chris Johnson did. After all, the Sacramento entrepreneur has already found success and landed his Rapid Ramen Cooker on the shelves of Walmart nationwide. Will send this to my sons. Taber (youngest son) is working on getting funding for his business. Ted (oldest son) is working with his client on marketing her product. That is exciting news Jeri! Make sure to keep in the loop on the progress. Excellent post! You gotta be PASSIONATE for people to feel your passion and respond to your pitch. Being passionate is key in anything you do!